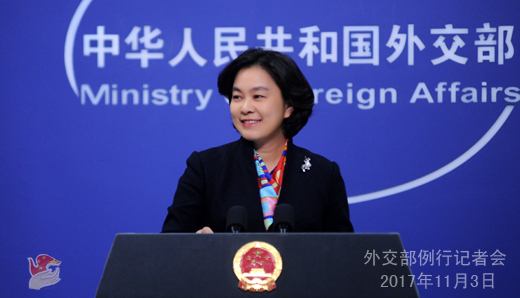 Q: According to reports, the meetings of the Committee of Disarmament and International Security , or the First Committee, of the 72nd Session of UN General Assembly that concluded on November 2 has incorporated the Chinese-proposed concept of building a "community of shared future for mankind" in its relevant resolutions. What's your comment on this? A: On November 2, the meetings of the Committee of Disarmament and International Security of the 72nd Session of UN General Assembly (the First Committee) concluded at the UN headquarters, which has written the Chinese-proposed concept of building a community of shared future for mankind into the resolutions of "Further practical measures for the prevention of an arms race in outer space" and "No first placement of weapons in outer space". The concept of building a community of shared future for mankind was incorporated into the UN First Committee's resolutions for the first time shortly after the successful conclusion of the 19th CPC National Congress. This has filled in a blank in the field of international security at the UN, which shows that the concept of a community of shared future for mankind reflects the shared aspiration of most countries and serves the common interests of the international community. It also demonstrates that China's idea has gained growing support globally and been increasingly echoed in the UN agenda. I believe this also showcases China's responsibility as a major country. We have noted that many members of the international community have appraised the incorporation of the concept of a community of shared future for mankind into the First Committee's resolutions. UN Under Secretary-General and High Representative for Disarmament Affairs Izumi Nakamistu said that the concept of "building a community of shared future for mankind" is highly consistent with the principle of the UN Charter as well as the UN concept of common security and peace, which offers a Chinese proposal for a world full of uncertainties and serves the common interests of the international community. President of the UN First Committee and Permanent Representative of Iraq to the UN Mohammed Hussein Moh'd Ali Bahr AlUloom said that, China's forward-looking concept of "building a community of shared future for mankind" is an effective way to address the global security governance predicament and should be promoted in the multilateral field. China has been contributing wisdom and strength to the security and future of mankind while pursuing its own development. The acting head of the Russian delegation to the First Committee Vladimir Yermakov said the Committee is an important platform to set international security agenda. It is of important significance that the concept of a community of shared future for mankind was incorporated into the resolutions of the First Committee. Pakistan's Ambassador to the United Nations Maleeha Lodhi said that the concept of building a community of shared future for mankind showcases China's vision to vigorously promote international cooperation in an interdependent world, and it is the most important and ambitious concept for promoting international peace and sustainable development in the 21st century. It offers an innovative thinking for the international community, that is, to establish a more equitable and reasonable international system through stronger integration of interests and deeper across-the-board cooperation. We will faithfully follow through on the spirit of the 19th CPC National Congress, continuously take Xi Jinping Thought on Socialism with Chinese Characteristics for a New Era as a guide, work with the international community to build a a new type of international relations and a community of shared future for mankind and make greater contributions to upholding world peace, security and development. Q: The US Air Force said that Two US B-1B Lancer bombers conducted a military exercise with Japanese and ROK warplanes in regions near the ROK. The DPRK said this these were simulating attacks on important targets inside the country. Is China worried about an escalation of tension on the Korean Peninsula again? Has China communicated with the US on this? A: Over some time, we have seen some deescalating remarks as well as words and deeds that may aggravate the contradiction and tension from the relevant parties of the Korean Peninsula issue. On China's part, we hope that given the current highly complicated, delicate and fragile situation, various parties will speak and act in a cautious manner and do more things that will encourage mutual trust and ease the tension. We hoe that parties can make joint effort to focus on bringing the Korean Peninsula nuclear issue back to the track of settlement through dialogue and negotiation. Q: Journalists with Agence France-Presse (AFP) have been looking into the Belt and Road projects in Indonesia, Kazakhstan, Uzbekistan, Pakistan, Thailand, the Laos and Singapore and found that lot of them are making very little progress. What is China going to do to deal with these issues? What is the overall objective of the Belt and Road Initiative? A: I don't know how did they come to such conclusion? What is it based upon? The main objective of China's Belt and Road Initiative is to synergize the development strategies of various countries through stronger international cooperation so as to give full play to each other's competitive strengths for win-win development. Over the past four years and so, the building of the Belt and Road has progressed smoothly with fruitful outcomes and won extensive agreement and support from the international community. A growing number of countries have engaged in the cooperation and many projects have begun generating tangible benefits to the people of the relevant countries. On November 2, the Spokesperson of the Commerce Ministry gave a briefing on the latest development of the economic and trade cooperation of the Belt and Road Initiative. He said that the economic and trade cooperation along the Belt and Road has gained prominent achievements with smooth progress and a number of major cooperation projects are speeding up in their implementation, among which are the China-Laos railway project you just mentioned, the highways in Pakistan and the China-Russia, China-Kazakhstan and China-Myanmar oil and gas pipelines projects. The Belt and Road Initiative is an open and inclusive cooperation initiative that gives a primary role to enterprises and follows market operation under the guidance of government. It is a long-term undertaking that calls for the joint effort of various parties, but not a uniform campaign like group callisthenics, and the progress of specific projects depend on the will for cooperation of the participants and accords with the objective laws of economic cooperation. 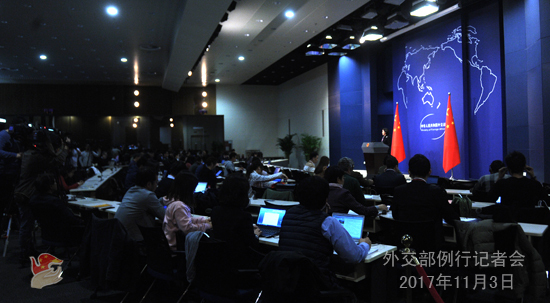 The report of the 19th CPC National Congress made important plans for promoting the international cooperation of the Belt and Road Initiative and the building of the Belt and Road has been written into the CPC constitution, which fully demonstrates China's determination of and confidence in firmly promoting the international cooperation of the Belt and Road Initiative. China will continue to deepen the mutually beneficial cooperation with relevant parties with the principle of wide consultation, joint contribution and shared benefits and in the silkroad spirit of peace and cooperation, openness and inclusiveness, mutual learning and mutual benefit. This will never waver or change. Q: Recent Wall Street Journal reports said three US aircraft carriers may conduct maneuvers near the Korean Peninsula. What is your comment? A: I've just taken a similar question. Considering that the present situation on the Korean Peninsula is highly complicated, delicate and fragile, all parties shall exercise restraint and do more for the alleviation, rather than aggravation, of tensions. Since relevant parties to the Korean Peninsula issue all have agreed that to peacefully resolve the Peninsula nuclear issue best serves the common interests of all sides, then let us focus on and proceed from endeavoring to bring all sides back to the track of dialogue and negotiation as soon as possible, enhance mutual understanding and mutual trust through dialogue, and seek a balanced solution to address the legitimate security concerns of each other so that the Peninsula nuclear issue will be peacefully resolved at an early date. Q: First, do you have any comment on the US government's announcement to formally order US financial institutions not to have any more dealings with the Bank of Dandong because of alleged business ties with the DPRK? Second, with regard to the Venezuelan President's announcement overnight that he wants to renegotiate the government's debts, does the Chinese government support that decision? Is the Chinese government worried about its own lending to Venezuela through Chinese financial institutions? 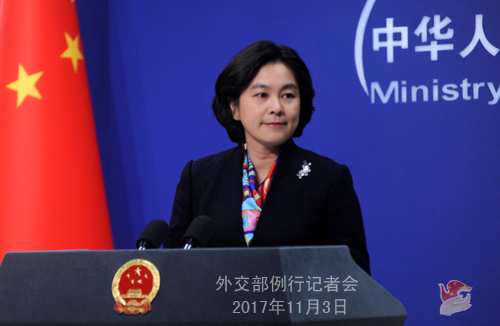 A: On your first question, as a permanent member of the Security Council, China has been comprehensively, accurately, faithfully and strictly implementing DPRK-related resolutions of the Security Council and fulfilling its international obligations. Meanwhile, we firmly oppose the imposition of the so-called "long-arm jurisdiction" by other countries in accordance with their domestic laws. On your second question, we have noted relevant reports as well as the positive pledges made by the Venezuelan government on honoring its debt obligations. China believes that the Venezuelan government and people are capable of properly handling the debt problem and ensuring its national stability and greater economic and social development. The China-Venezuela financing cooperation is a commercial one between Chinese and Venezuelan financial institutions and enterprises in the principle of equality, mutual benefit and common development. The relevant cooperation is progressing smoothly at present. China will continue its practical cooperation with Venezuela in various areas to promote our common development.